Mars is a desert planet, a lot like some deserts on Earth, but much colder. Also just like Earth, the Martian deserts have vast dunes, ranging from small sand ripples (technically not dunes) to towering, cliff-like true dunes of fine sand. But – while various types of dunes have been seen from orbit and up close by Mars rovers, currently still active and gradually making their way across the landscape – now another kind of dune has been found on Mars as well. 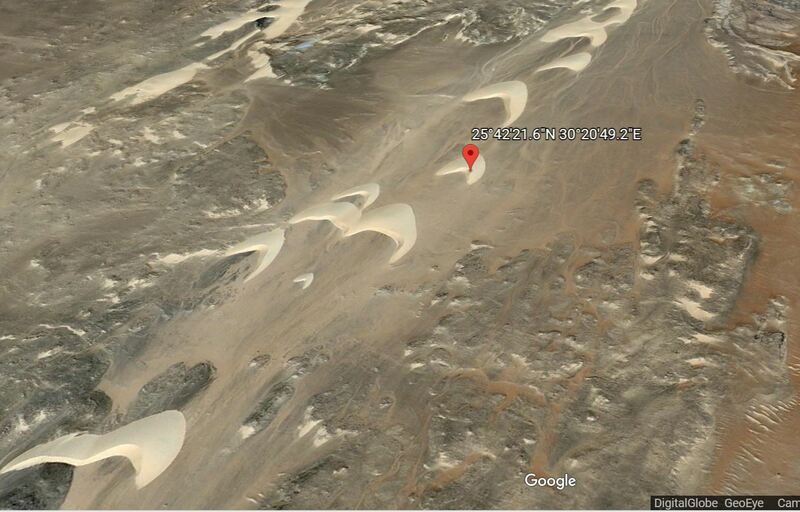 Scientists call these ghost dunes, and they are very ancient. They reported the finding in GeoSpace on July 10, 2018. 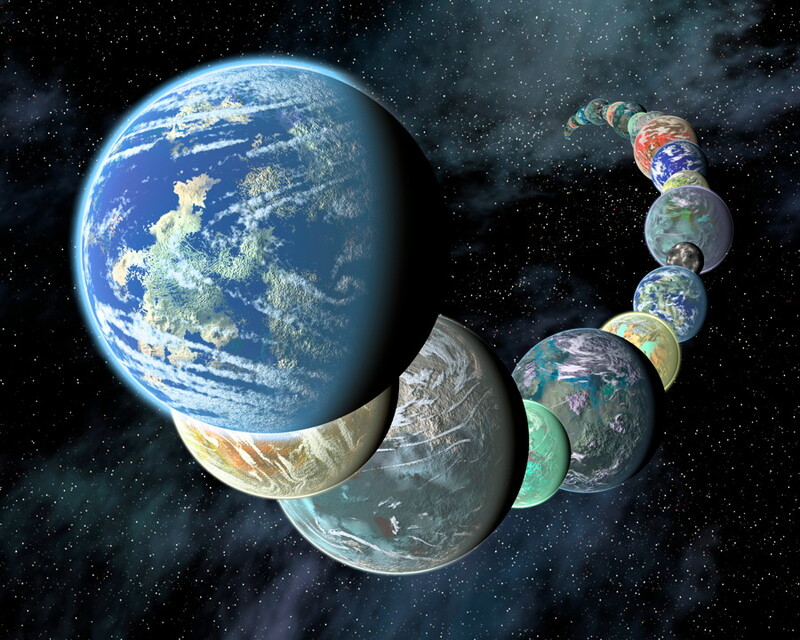 The new research paper was just published in the Journal of Geophysical Research: Planets. How do ghost dunes form? On Earth, ghost dunes may have been partially buried by lava or water-borne sediments. For these Martian ghost dunes, when the lava or sediments hardened, they preserved the contours of the dunes. The remaining top portions of the dunes were then eroded away by winds, which scoured them out, leaving only the “mold” outlines of the former dunes. Now they look like pits with hardened edges. 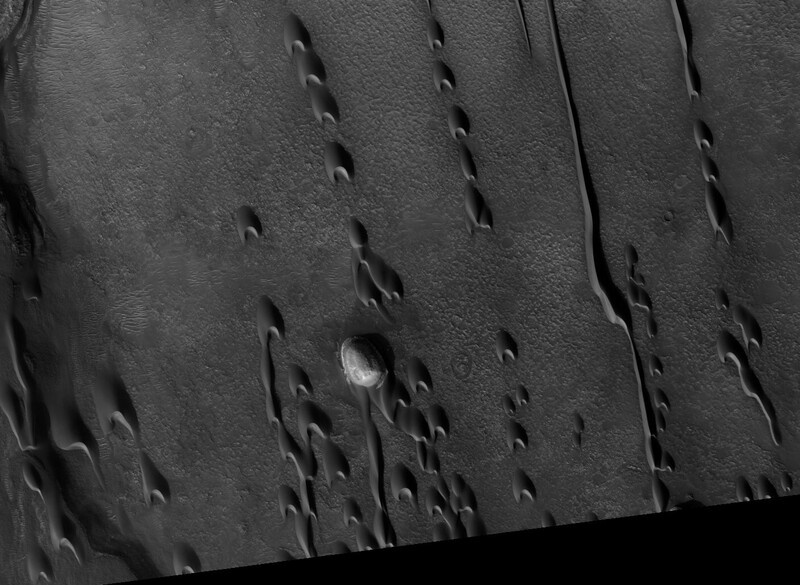 The Martian ghost dunes were found in orbital images of Hellas Planitia basin and Noctis Labyrinthus. They are similar to ones discovered in the Snake River Plain in eastern Idaho in 2016. More than 480 potential dune molds were discovered in orbital images of Noctis Labyrinthus alone, and more than 300 in Hellas Planitia, by Day and co-author David Catling. Noctis Labyrinthus is a region of jumbled plateaus just west of Valles Marineris, the largest-known canyon in the solar system. Hellas Planitia is a massive 4-billion-year-old impact crater over 2,700 kilometres (1,678 miles) across in the southern hemisphere. 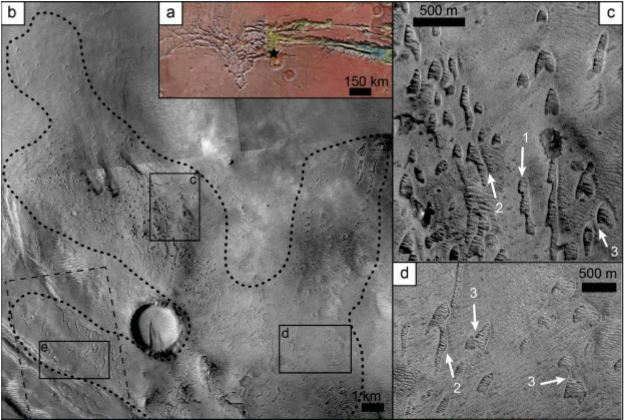 Analysis of the ghost dunes on Mars indicates that the original dunes were quite large – about 40 metres (130 feet) tall at Noctis Labyrinthus and 75 metres (246 feet) tall at Hellas basin. By comparison, the Curiosity rover has studied a series of dunes near the base of Mount Sharp in Gale Crater. The striking Namib Dune is about 5 metres (16 feet) tall. 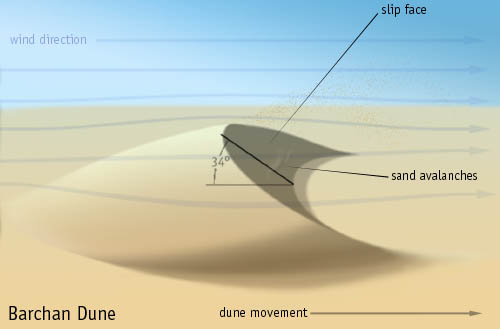 As well as being common on Earth, dunes have also been found on Mars, Venus, Titan and even comet 67P. Now another type of dune has been discovered on Mars – “ghost dunes,” the pit-like remains of ancient, once-active dunes which have mostly eroded away. They bear a strong similarity to present-day dunes and may even hold clues to past life on the Red Planet.